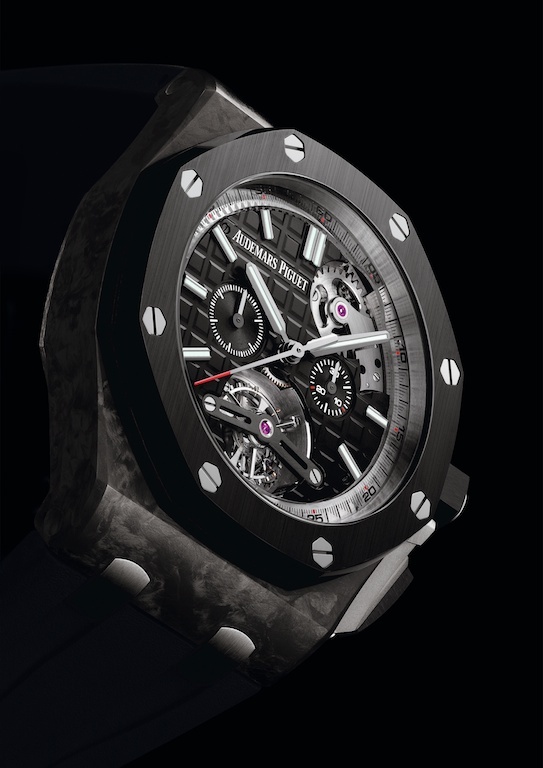 In the world of watchmaking, there is news, and there’s actual news. 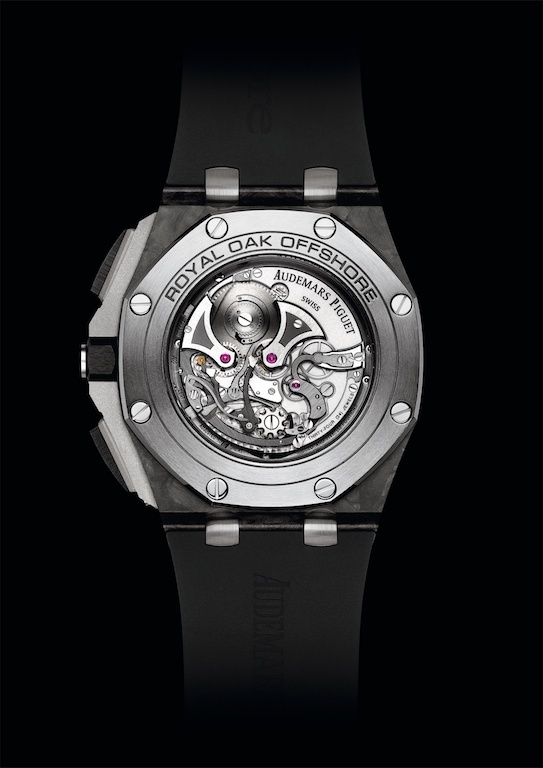 Here we have the latter: the Royal Oak Offshore Selfwinding Tourbillon Chronograph. This is something rather special. 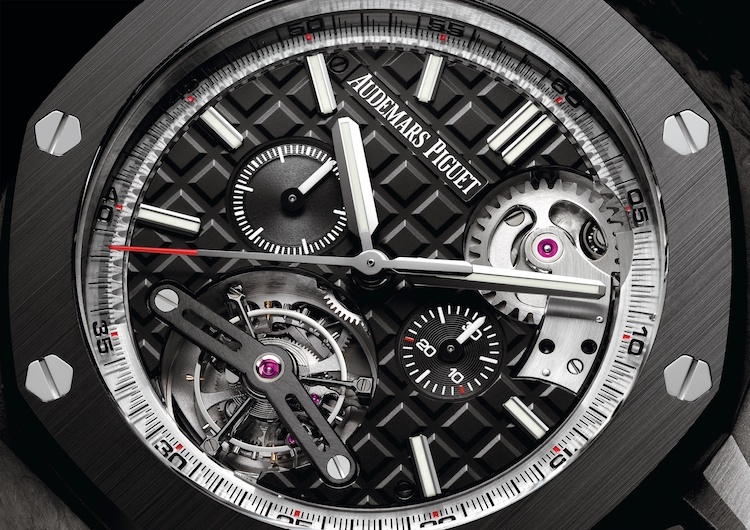 Combining a tourbillon with a chronograph is never a trivial challenge, but what we’ve got here is a fully integrated, in-house tourbillon chronograph movement, that also uses a peripheral winding system, and is constructed and finished to the highest haute horlogerie standards; a very, very exciting new movement from Audemars Piguet. The movement is the calibre 2897 –a peripheral rotor, self-winding, column wheel controlled movement with tourbillon, it is one of the very few peripheral rotor self-winding tourbillons anywhere, and a very rare example of a non-Grand Complication, self-winding chronograph movement from Audemars Piguet. The Grand Complication movement, calibre 2885, is self-winding (though not with a peripheral rotor) and incorporates a rattrapante chronograph, perpetual calendar, and minute repeater. While the calibre 2897 is technically simpler it is in some respects more interesting, as peripheral rotor wound integrated chronograph or tourbillon movements are unusual and to find the two together is almost unheard of. The movement is beautifully finished and the action of the peripheral rotor is visible on the dial side, where the intermediate wheel from the peripheral platinum mass can be seen in action; visually, it balances the tourbillon, with its large balance and balance spring with mathematically corrrect Philips terminal curve, quite beautifully. 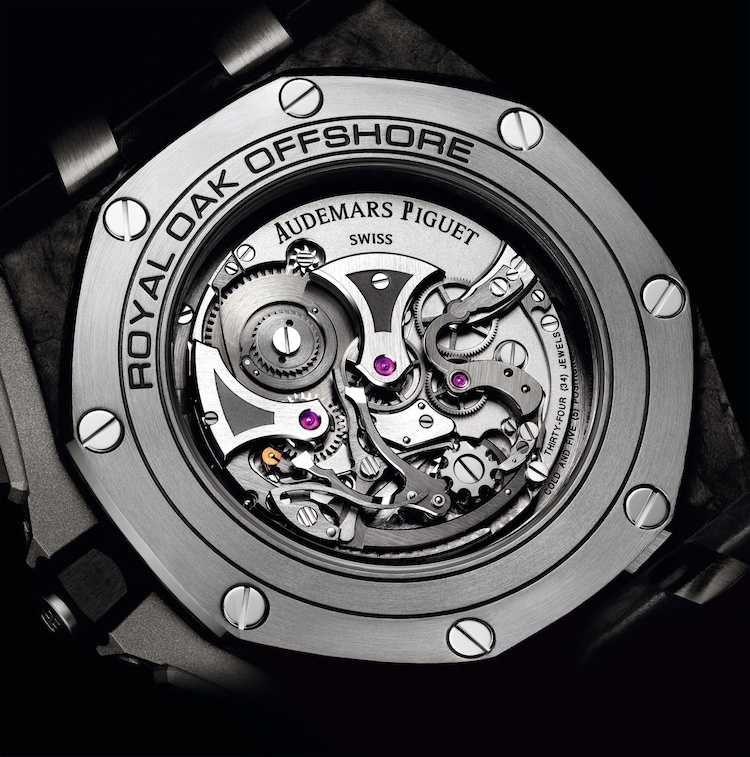 The Royal Oak Offshore debuted in 1993 and while it is for understandable reasons considered a somewhat modern, even aggressive, design here it is paired with a movement with a number of extremely traditional design cues, all of which are easily visible, without interruption, thanks to the peripheral rotor winding system. This is an historically important watch, and movement, for Audemars Piguet: its first fully integrated, column wheel chronograph movement with a peripheral winding system. 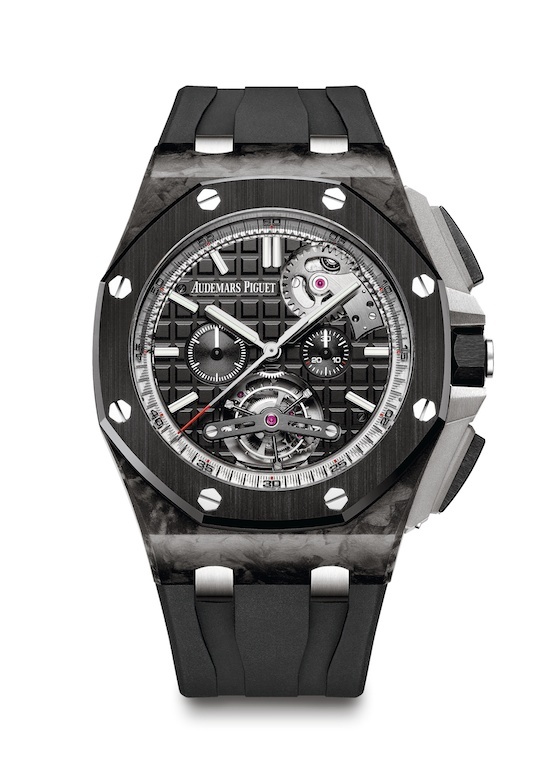 Especially when coupled with the 42mm case it suggest a whole new world of horological expression for the Offshore –and it’s a benchmark, and landmark, timepiece for Audemars Piguet. 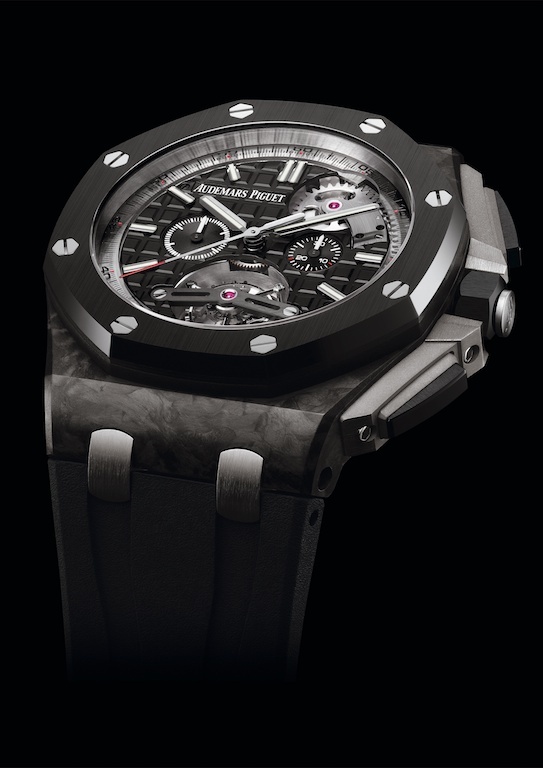 Forged carbon case, glareproofed sapphire crystal caseback with Royal Oak Offshore engraving, black ceramic bezel, crown and pushpieces, titanium pushpiece guards. Black dial with “Méga Tapisserie” pattern, black counters, gold applied hour-markers and gold Royal Oak hands with luminescent coating. Sapphire inner ring.